"Acts & Facts" is ICR's monthly news booklet. ICR's purpose is to advance the cause of true science and education, winning people to Christ, and strengthening the Christian witness by promoting creation thinking in science and Scripture. ICR’s monthly Acts & Facts magazine offers fascinating articles and current information on creation, evolution, and more. Our Days of Praise devotionals provide daily Bible studies to strengthen the Christian witness. Stay on top of the latest scientific discoveries and how they affect our understanding of the Bible with ICR’s free publications. Join nearly 50,000 subscribers who enjoy quarterly issues of this creation-based worldview magazine from Answers in Genesis. Each issue is packed with relevant articles, stunning photos, and graphics that equip you for the culture war in society today. Every Answers issue contains numerous major articles, an 8-page "mini-magazine" for children, and a detachable wall chart. The purpose of Answers is simple—to equip you, the reader, with practical answers so you can grow in your faith and confidently communicate the gospel and biblical authority (the fact that the Bible is trustworthy and authoritative) with accuracy. When Dr Carl Wieland started Creation magazine (Ex Nihilo) in his home in 1978, little did he realize that today it would reach into some 140 countries around the world and have a huge impact on the lives of many. 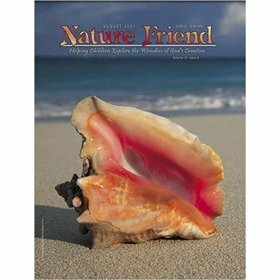 Readers call it, "The Christian answer to National Geographic"
-- EVERY ISSUE A KEEPSAKE! The editors and publishers are a Christian couple, Tom and Jennifer Ish, who homeschool their daughter, Melissa, and have dedicated their lives to serving God by providing positive choices in reading material for the whole family. 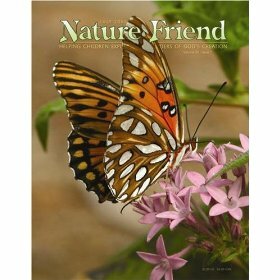 Nature Friend magazine, begun in 1983, was produced mainly by the Stanley and Janice Brubaker family of Goshen, Indiana, owners of Pilgrim Publishers. It was born out of Stanley’s desire to encourage children to believe in God as their Creator and to seek out, recognize, and appreciate His handiwork.